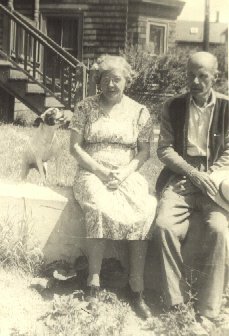 Comments: George Julian (Nee: Bacon) | Milford MA USA | 1921-1940 | Comments: This is George and Edith Bacon Julian, my Ggrandparents at their home in Milford MA. Grandpa died I believe in 1941 Grams died in 1963 but she in Millis Middlesex MA. They are buried in St. Mary's Cemetery in Milford MA. They did adore their dog. I am not sure what type of dog he was. They also had love birds.